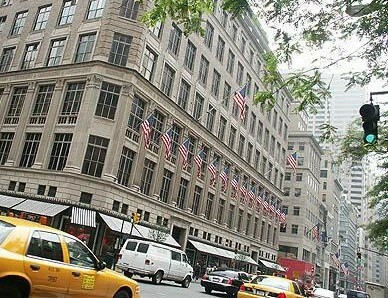 The epicenter of New Yawk glory: Saks Fifth Avenue. There is something to be said for knowing who you are and where you fit. Now, it would be fantastic to be like the Queen of the Chessboard who glides imperiously into any setting and, by the resplendence of her power, simply belongs. But the reality is... well... not quite so glorious. Last year (pre-Olivia), JC and I took a weekend trip to Manhattan to explore and enjoy the city. I love New York because it hums with life like a beehive, and there is such a wild variety of things to be seen, starting with the people. The Hasidic Jews are my particular favorites. So, off we went to eat some good Jewish bagels with cream cheese for breakfast, along with an Italian cappuccino-- all bought, of course, from the Arab guy behind the counter. After a morning at St. Patrick's and some symbolic shopping on 5th Avenue (I think maybe we bought a t-shirt), we decided to head downtown into SoHo. That was when I felt the sting of "I don't fit." While strolling along in the late afternoon, we wandered into a DKNY (that's Donna Karan New York for any fashion neophytes-- yes, allow me to instruct you from the depths of my fashion erudition) to take a look around. "Can I help you?" said the sales guy, looking very dapper all in black. "Um... just looking," I said. JC had disappeared into the dressing room to try on a potential Symbolic Purchase. Meanwhile, I was ogling the dresses. I love dresses and I am magnetically attracted to them. I have no real gift for fashion myself-- things just sort of look okay, not spectacular, on me. But I fervently admire those women who have a gift for throwing on a dress, a necklace, a pair of vertiginously high heels, a status handbag, and the obligatory Star Power sunglasses, looking like they belong on the Champs Élysées. So I just stood around, gazing around in wonderment like a kid in a candy shop (but trying not to be too obvious about it). "You're not from here, are you?" said the guy, crossing his arms and leaning back conversationally. "No..." I said, sensing an unfortunate turn in the conversation. And then-- I didn't want to ask, but I was curious: "Why do you say that?" "Oh, I can just tell," he said chattily. "You both look like you're from out of town." I looked down at my outfit self-consciously. From out of town? As in country bumpkin? What did he mean? Was it my powder pink rain jacket? My non-status purse? I felt my face flush with embarrassment. Because I am a glutton for punishment, I asked carefully, "What do you mean by 'from out of town'?" "Oh, you know," he said. "It's just that New Yawkas, they have a certain kind of energy, a kind of drive. They come in here, they know what they want. You guys are just, you know, lookin' around..."
Seeing my face, he added hastily, "It's cool, it's okay. So, where're you guys from?" "Atlanta," I said icily, looking away and praying that JC would hurry up. It was sort of true. It seemed better than saying, "Oh, I'm from the hinterlands of the Uncultured... upstate New York, the place where New Yawkas never go." Atlanta was a safer choice. Plus it was temporarily true. I had been living there for 3 or 4 months already. "And he's from Mexico," I said. "OK, that's cool, that's cool," he said, still in Mollifying Mode. But the damage was done. My pride was pricked. This guy picked us out, I thought to myself. We are obviously Gawking Tourists, coming to the Hub of Civilization to see how the Beautiful People live. Well, golly, thanks a lot. Then JC came out. There would be no Symbolic Purchase here, he decided. Time to move on to the next shop. So off we went... and I made sure to stride purposefully out, sure of what I wanted... to get the hell outa there. The next time we were in New York, it was for Olivia's Mexican citizenship papers. We stayed at a hotel in Manhattan to make it on time to our early morning appointment with the consul, and went purposefully, directly (with a hurried, driven look) to the consulate. 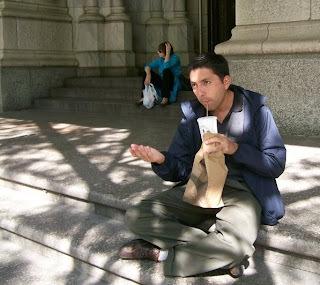 Later, we returned with purposeful New Yawka haste to eat lunch and feed and change the baby. And after a short stroll to the Rockefeller Center, we headed back to the consulate again for a second appointment and then went back to the hotel. This time, the hotel security officer decided to chat with us. He was wonderfully human. After sharing some of his own experience from a failed marriage, he told us that we looked very united, and of course, that the baby was beautiful. He was not speaking down at us from the heights of New Yawk Sophistication; he was just himself, and we were just ourselves. It was refreshing and real. So there are these two sides--among many, many others-- to the New York experience. There is the high gloss of Big Money and Big Ambitions with the smooth, silent elevators that open with a muted 'ding! ', the shop windows filled with the avatars of a lifestyle unattainable for most mere mortals, and the sneering shop clerks, masters of the consulates of DKNY and Louis Vuitton and Prada and Ralph Lauren, who later go home to apartments the size of a postage stamp. There is that sense of glorious ownership of "We got all this and we're all that!" that can fill hearts with a kind of proprietary pride. This is my world. This is where I belong, among the towers of steel and mirrors. What about your world? I get it. I'd probably feel the same way if I lived there. But then there is also the human side of New York, the rich texture of races and people, many from humble backgrounds-- immigrants from Mexico, Puerto Rico, Kenya, Iran, Egypt, China, Taiwan, Israel-- who responded to the beacon call from Long Island's shore: "Give me your tired, your poor, your huddled masses yearning to breathe free..." (Welcome to the pollution.) These are people who simply are what they are, hustling to make a living in a land of opportunity. They don't have a big image to uphold or carry before them as an Identity Enhancer. They aren't wealthy, but they can afford to be human. I like that contrast in New York. It's the energy and the contrast of those two worlds that can be breached with talent and hard work. In Mexico, those two worlds circulate in separate orbits: there are the rich, and the not rich, two mutually exclusive categories with no mobility from one to the other. But in America, anybody can become someone. So yes, I do love New Yawk... and that's why I keep going back. But now, as I grow out of my fear of what the sophisticated shop clerks might think of me, I'll go with a sense of pride and freedom. As Popeye once said, "I yam what I yam." And maybe that's the real power of the Queen of the Chessboard... she is just herself. New Yawk is a fascinating place. And I really enjoy your writing! I would rather be the take-it-slow, just-looking out-of-towner, myself. New Yorkers never seem to relax. The ironic thing is, the shop clerk probably can't afford to buy anything in the store he works at!